I had no idea how long on trip around our loop was. 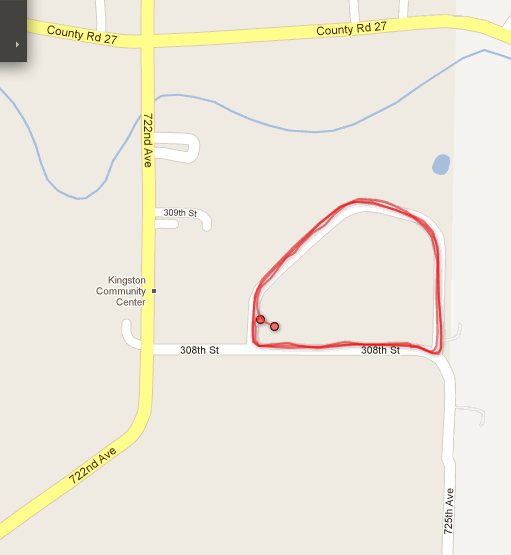 (It is ~0.6 miles) I walked three laps (1.88 miles) in about 34 minutes. My pace was between 3.5 & 5.9 miles per hour. The loop is moderately hilly so it was a nice work out. At the end of the walk I uploaded the info to my Google Docs folder. I was able to create a map of the walk, look at my stats, and it creates a log/journal of the activities. I will have to try to get out walking more often and play with this software a bit more.